I think this has to be the first time that we have profiled a woodturner who is also a dentist! I must say that it is an unusual honour to do so as Michael's work is simply stunning. The latest piece he shared with me was 'Blowing Smoke', which is part his of 'Knot Art' series. Whilst I cannot claim to understand the mathematical principles behind the design of such a piece, aesthetically, it appeals to me greatly. So, I was eager to find out about Michael's interests and just how he made his foray into turning given his medical background. Michael explains that he was born and raised in Denver, Colorado. He went to college at the University of Colorado and then obtained his DDS degree at the CU School of Dentistry: "I then went on to complete a 20-year career with the Public Health Service at several locations around the US, with my last station being in Alaska, which I loved, but it was just too dark in winter for my wife, Susan." After retiring from the PHS, Michael and his family made the decision to move to Susan's ancestral home in Springfield, Vermont. Michaels tells me that he still practises dentistry full-time but manages to balance this with his time in the workshop creating his turned objects. Luckily, his wife allows this because it keeps him happy, and also because she is very artistically gifted herself. magazine, I was able to construct my first segmented piece and that was it. I was hooked!" Over the years, as his turning skills have developed, Michael has designed and completed numerous segmented pieces as well as adding to and extending his turning repertoire. When you look at Michael's work, you can instantly tell that this man has a mathematical and scientific mind. Michael alludes to the fact that he has always been fascinated by the sciences but especially enjoys reading about the latest in astronomy, physics and biology. In his own words: "I find beauty in the more ordered mathematical forms as well as in the organic forms found in nature. Many of the forms and shapes that I have come across are unusual, but quite interesting. 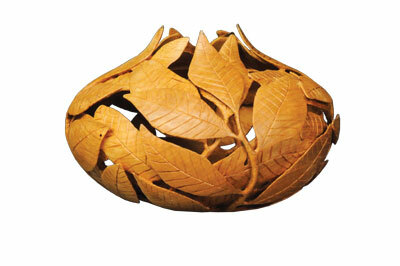 I find it a fulfilling challenge to translate some of these forms into pieces derived from turning." Michael explains that recently he has been exploring various methods of altering turned forms and he also enjoys adding texture such as carving, which helps to add an extra dimension to what can be created on the lathe. As you can see with many of his pieces, this turner also likes experimenting with texture, colour and pyrography techniques. Unsurprisingly, Michael has always had a love for art which stems from his childhood. These days he enjoys going to museums. 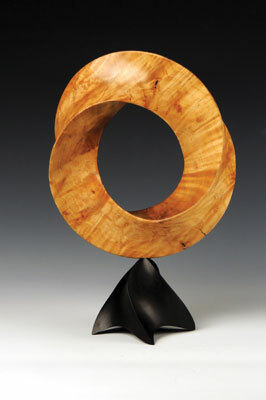 As a teenager, however, he did some oil painting and took some art classes in college, but it was only in his adult years that he discovered his real passion in the combination of woodturning and sculpture. When I asked Michael why he finds wood such a pleasing medium to work with he refers to the fact that this material provides an endless palette of colour, texture and grain, and to its innate workability. In Michael's words, he has not really developed a signature style, mostly because he is drawn to learning new techniques and trying to work outside of his comfort zone. Michael says that he is always motivated to try to create a piece that involves the learning of a new skill or producing a piece that is very different from his previous work. As Michael says: "Life is too short not to follow your passion." When you look at Michael's broad portfolio of work, you can see that his pieces generally fall into three series: diatoms, minimal surfaces and the Fibonacci series and its relationship with nature. These series are held together by the theme, not the style. 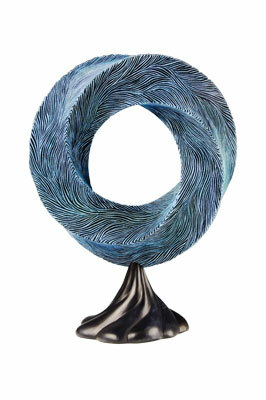 These sculptural pieces include piercing, carving, sculpting, burning and colouring. "The idea is the starting point. From there the challenge is to design the work and puzzle out how to make it a reality using the lathe. 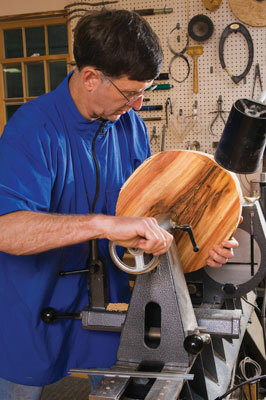 Each piece is different and requires innovating ways of holding the work on the lathe. Solving these problems is what I find the most rewarding part," he tells me. I was intrigued to find out just how Michael came up with the idea to fuse the medium of woodturning with mathematics and electron microscopy. Yes, we know that this turner has a love of the sciences, physics, astronomy and biology, but how do you come up with the notion to incorporate these disparate ideas? "These interests have naturally crept into my turned art. I am not sure where I originally was introduced to minimal surfaces, but that branch of maths generates some really amazing 3D forms when the maths is graphically rendered. There are numerous programs that allow you to fiddle with the inputs and get some pretty amazing structures," he explains. Obviously, working out the construction of such intricate pieces requires the mind of someone who understands the subject matter incredibly well, and Michael succeeds in not only producing a piece that is visually elegant but also in producing a piece that satisfies his interest in science and mathematical sequences, which is certainly a rare gift. As well as being influenced by his love of science and numbers, Michael also has an appreciation for amazing nature photography. 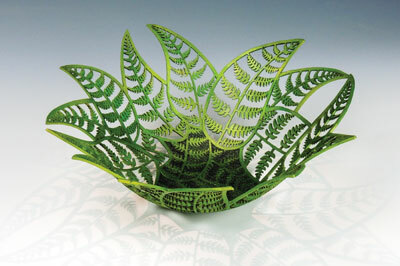 He recalls having a picture of a giant Lobelia plant that a National Geographic photographer shot from above and being intrigued by the arrangement of the leaves, and from this point deciding to do a turning based on it: "I realised that the plant had two different spiral arrangements in the leaves and started counting them. I found there were 13 spirals in one direction and thought that can't be right, but my wife said it was probably because of the Fibonacci series." Michael consequently realised that indeed this was the case, which further goes to emphasise his creative flair for fusing the elements of turning, maths and nature. In terms of other turners who inspire Michael, the list is extensive. He recalls attending a Richard Raffan demo in Phoenix about 22 years ago, and according to Michael, Richard is probably one of the turners who influenced him the most. 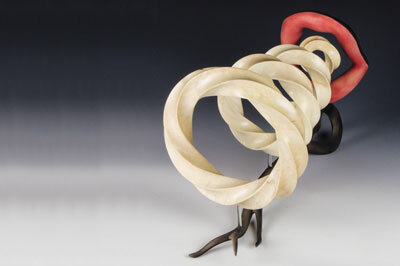 Michael's love of segmented work has introduced him to segmented turners such as Ray Allen, but others also include Gerrit Van Ness, Art Liestman, Binh Pho, Jacques Vesery, Ron Layport, J. Paul Fennell and Gordon Pembridge. Michael tells us that after moving to Vermont, he was able to build his dream workshop, which also doubles up as a studio for his pieces. The workshop is situated in the first floor of a renovated barn and is kitted out with a wide variety of turning tools. Michael has also further upgraded his lathe and now turns on a Robust American Beauty lathe. The workshop also features piped-in compressed air to multiple outlets and a closet in the basement that houses dust collection equipment and the compressor. There is also extensive lighting and Michael explains that he wired in more fixtures than he currently uses, in preparation for when he gets older and his vision deteriorates. "I spent a winter designing the shop for ergonomics and versatility before our move and am really pleased with the results." Like many turners, he loves tools and has a huge range in his workshop. His favourite tool is an older 12mm Glaser gouge with a Michelson grind. This is a free-hand grind that leaves around 1mm as a bevel, but the rest of the bevel is swept away, which allows the tool to get into tighter areas and prevents the bevel from bruising the wood. For hollowing end grain, Michael uses many of the standard hollowers including those made by John Jordan, a Lyle Jamieson hollowing rig, a Rolly Munro tool and his favourite Hunter tools. In terms of Michael's turning career to date, his list of accolades and the places in which his work is displayed are numerous. He currently has an exhibition at a local art museum and has won prizes in national competitions of woodturning, as well as local arts and crafts venues. In his own words, he is a terrible marketer of his own work, purely because he has the luxury of turning as an interest rather than relying on it for a living. "As a result, much of my work ends up cluttering my gallery, but I don't mind, as I enjoy the process of turning far more than the end result," he tells me. I can adapt what is in my head to the real wood in front of me. For more examples of Michael's stunning pieces, see his website.